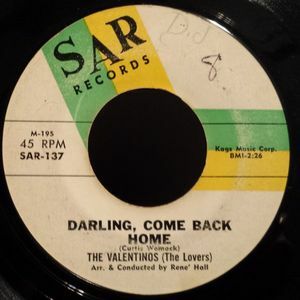 THE VALENTINOS-LOOKIN’ FOR A LOVE-THE COMPLETE SAR RECORDINGS. The story of The Valentinos began back in 1952, in Cleveland, Ohio. That’s when the Reverend Friendly Womack first heard his five sons sing. Before long, Friendly, Curtis, Bobby, Harry and Cecil had adopted the moniker The Womack Brothers. They then made their debut in their father’s church in the East 85th and Quincy district of Cleveland. A years later, in 1953, The Womack Brothers met a man who would help launch their career, Sam Cooke. By 1953, Friendly Womack Jr, who sung bass, was twelve, while ten year old Curtis and Bobby aged nine, sang lead. Harry, who was only eight, was first tenor, and later, would play bass. Cecil who at aged six, was the youngest Womack Brother, sang baritone. He and the rest of the Womack Brothers modelled themselves on The Swan Silvertones, The Swanee Quintet and of course, The Soul Stirrers, who were lead by Sam Cooke. He was a huge influence on The Womack Brothers’ nascent career. So, Friendly Womack decided to take his sons to see Sam Cooke. Straight away, Sam Cooke was impressed by The Womack Brothers. When he saw them wearing their uniform, he remarked that “you look like singers.” With the naivety of youth, one of The Womack Brothers replied “we are singers.” So, Sam Cooke told The Womack Brothers “if you can sing, you can open the program.” The other members of The Soul Stirrers weren’t pleased, arguing that there was no room for The Womack Brothers. Sam dug his heels in, saying if The Womack Brothers didn’t sing, neither did he. This worked. After an impromptu audition, Sam decided that The Womack Brothers were opening the show. Later that day, The Womack Brothers opened for The Soul Stirrers at Cleveland’s Friendship Baptist Church. That night, The Womack Brothers won over the congregation. Sam Cooke was more than a little impressed, and would later, play a part in the rise and rise of The Womack Brothers. Before that, The Womack Brothers made their recording debut in 1954. Their debut single was Buffalo Bill, which was released on the Cleveland based Pennant label. On its release in 1954, Buffalo Bill sunk without trace. This was an inauspicious start to The Womack Brothers’ twenty year recording career. As the fifties drew to a close, no other record company had showed any interest in The Womack Brothers. So, they continued to tour, resulting in The Womack Brothers becoming one of gospel music’s best up-and-coming groups. Then fate intervened. Roscoe Robinson, who sung second lead with The Blind Boys, was working with The Womack Brothers. He chauffeured them from concert to concert. One night, The Womack Brothers told Roscoe what they were looking to sign to a record label, but so far, were having no luck. That’s when Roscoe mentioned that Sam Cooke had just founded his own record label, SAR Records. He said would speak to Sam Cooke. When Roscoe phoned Sam Cooke, he told his old school friend just how talented a group The Womack Brothers were. So, Sam Cooke agreed to meet The Womack Brothers in Detroit, where he The Soul Stirrers were appearing live, two weeks later. Two weeks later, The Womack Brothers made their way to Detroit. When Sam heard The Womack Brothers he was immediately won over. Straight away, Sam signed The Womack Brothers to SAR Records, the label he founded with his business partner and ex-Pilgrim Traveller J.W. Alexander and Soul Stirrers’ founder S.R. Crain. Little did any of the three owners of SAR Records realise, that The Womack Brothers would become one of their most successful signings. Between 1961 and 1964, The Womack Brothers, who became The Valentinos, were signed to SAR Records. During that period, they released ten singles. Each of these singles feature on Lookin’ For A Love-The Complete SAR Recordings, which was recently released by Ace Records. Lookin’ For A Love-The Complete SAR Recordings, which features twenty-three tracks, including four unreleased tracks, tells the story of The Womack Brothers shift from gospel music, to secular music with The Valentinos. This transformed The Womack Brothers’ career. Originally, when The Womack Brothers signed to SAR Records, they were a gospel group. That’s what Sam Cooke signed The Womack Brothers as. Their SAR Records debut was Somebody’s Wrong, with Yield Not To Temptation on the B-Side. It was recorded in Chicago on 28th June 1961, and released in July 1961. On its release, Somebody’s Wrong failed to chart. Neither did The Womack Brothers’ sophomore single, Couldn’t Hear Nobody Pray, which featured Somewhere There’s A God on the flip side. With The Womack Brothers’ first two singles failing to chart, Sam Cooke realised something had to give. The answer was staring him in the face. What The Womack Brothers had to do, was turn their back on gospel music. This wouldn’t please many people. For the past ten years, The Womack Brothers’ name was synonymous with gospel. Crossing over was a big decision. The Womack Brothers were making a good living singing gospel. Through touring America, they had established a reputation as one of gospel’s biggest groups. This was all very well. However, chart success eluded The Womack Brothers. So the decision to cross over was made on 28th February 1962. It didn’t please the man who founded The Womack Brothers. Friendly Womack, The Womack Brothers’ father, wasn’t happy with his son’s decision to turn their back on gospel. For the past ten years, he had encouraged and supported them. Now, less than a year after signing to SAR Records, his sons were turning their back on gospel music. However, this wasn’t the end of the bad news for Friendly Womack. With The Womack Brothers’ name synonymous with gospel, it made sense for the group to rebrand, and change their name. So The Womack Brothers became The Valentinos. This marked a change in fortune for the Womack brothers. On 28th February 1962, the day The Womack Brothers crossed over, and became The Valentinos, they entered the recording studio, and recorded two songs. This included their debut, secular single Lookin’ For A Love. It’s a stonewall classic, that would four months later, would launch The Valentinos’ solo career. On the flip side was the often overlooked Somewhere There’s A Girl, a beautiful heartfelt paean, full of longing. Just under four months later, Lookin’ For A Love was released as a single. On the release of Lookin’ For A Love, in June 1962, it reached number seventy two in the US Billboard 100 and number eight in the US R&B charts. 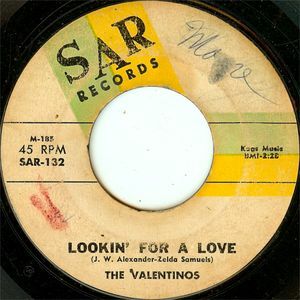 Lookin’ For A Love would become, without doubt, The Valentinos’ best known song. It would later, be rerecorded by Bobby Womack, and become one of his best known songs. That was still to come. Before that, The Valentinos looked like they were on their way to becoming one of the top soul groups of the early sixties. It wasn’t until December 20th 1962, that The Valentinos entered the United Recording studio again. With engineer Bob Kidder, and Sam Cooke acting as producer, The Valentinos recorded Darling, Come Back Home, I’ll Make It Alright and Tired Of Livin’ In The Country. 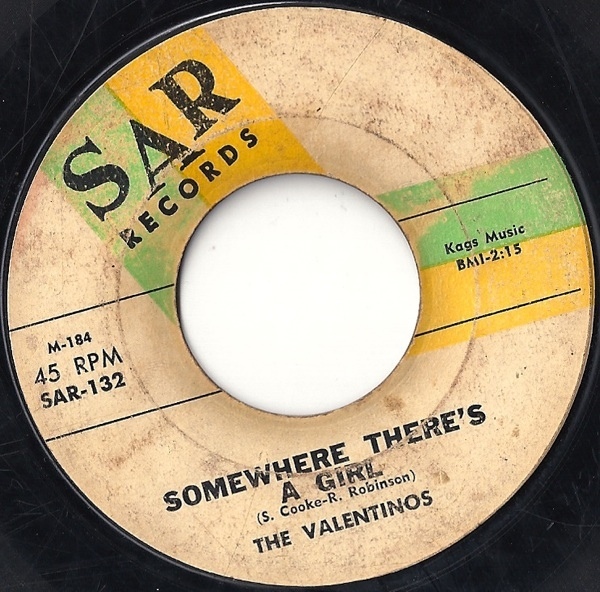 Two of these tracks became The Valentinos’ next single, while Tired Of Livin’ In The Country has lain unreleased for fifty-three years. I’ll Make It Right was released as The Valentinos’ sophomore single in January 1963. On the B-Side was the tender, pleading ballad, Darling, Come Back Home. Both tracks were penned by Curtis Womack, who was flourishing as a songwriter. Bobby, meanwhile, was flourishing as a singer. He delivers a gravelly, vampish vocal on I’ll Make It Right, which stalled at just number ninety-seven in the US Billboard 100. For The Valentinos, this was something of a disappointment. This was the last that was heard of The Valentinos until July 1963. July 1963 saw The Valentinos return to the recording studio. This time, they headed to Bell Sound Studio, New York. That’s where The Valentinos recorded three tracks. This included the Bobby Womack and Sam Cooke composition She’s So Good To Me, Baby, Lots Of Luck and the Bobby Womack penned Bitter Dreams. The Valentinos that one of these tracks would get their recording career back on track? Away from the recording studio, The Valentinos were a successful live band. They were, at one point, earning $1,500 a week. The only rub was, that The Valentinos had to play five concerts a day. So a million selling single would prove more profitable. Sadly, that wasn’t to be. The John Greek penned Baby, Lots Of Luck was released as a single in August or September 1963, with She’s So Good To Me on the B-Side. Despite being one The Valentinos’ finest and smoothest singles, it failed to chart. Neither did Bitter Dreams, The Valentino’s fifth single. It was the perfect showcase for a blistering vocal powerhouse from Bobby Womack. This was a tantalising taste of what Bobby was capable of. Sadly, very few people heard Bitter Dreams. Sam Cooke must have been having nightmares. Another six months passed before The Valentinos returned to the recording studio. On March 24th 1964. That day, The Valentinos recorded five tracks. By then, Bobby Womack had become The Valentinos principal songwriter. He wrote I’ve Got Love For You and Don’t Go Away. Bobby cowrote It’s All Over Now with Shirley Womack. His other contribution was Rock In The Cradle Of Love, which he penned with Zelda Samuels. The other two tracks recorded that day, were Sam Cooke’s Sugar Dumpling and Tired Of Living In The Country, which featured Johnnie Morisette on deep bass vocal. Only two of these tracks were ever released by The Valentinos. Two months after the recording sessions, It’s All Over Now was released as The Valentinos next single. On the flip side, was Tired Of Living In The Country. It’s All Over Now got The Valentinos’ career back on track. It reached number ninety-four on the US Billboard 100 charts, and number twenty-one in the US R&B charts. At last, it looked as if The Valentinos luck had changed. 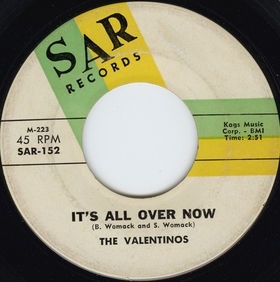 For the followup to It’s All Over Now, The Valentinos didn’t release any of the other tracks recorded in March 1964. Instead, I’ve Got Love For You wasn’t released until Sam Cooke’s SAR Story was released in 1994. The other three tracks, Don’t Go Away, Rock In The Cradle Of Love and Sugar Dumpling make their debut on the recently released Ace Records’ compilation Lookin’ For A Love-The Complete SAR Recordings. To record the followup to It’s All Over Now, The Valentinos headed to RCA Studios, Hollywood, on 19th September 1964. At RCA Studios, The Valentinos recorded Everybody Wants To Fall In Love, Put Me Down Easy, To Show My Love and Shakin’ This Way And That (Lassie). This would be The Valentinos’ final recording session for SAR Records. Things were about to take an unexpected twist. 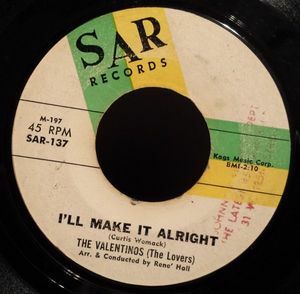 Everybody Wants To Fall In Love proved to be the final single The Valentinos released on SAR Records. It failed to chart. Sadly, there was no followup and Put Me Down Easy, To Show My Love and Shakin’ This Way And That (Lassie) remained unreleased until the release of Lookin’ For A Love-The Complete SAR Recordings. That might have different, if not for the events of December 11th 1964. That night, Sam Cooke died on 11th December 1964 aged just thirty-three. Police reports state that Sam Cooke booked into the Hacienda Motel, Los Angeles earlier on the 11th December 1964. Later, things went awry. Sam Cooke burst into the manager’s office-apartment in a rage, wearing nothing but one shoe and a sports jacket. A furious Sam Cooke, wanted to know where the woman who accompanied him into the Hacienda Motel was. Feeling threatened, Bertha Franklin, the motel manager, shot Sam Cooke through the hurt. When the L.A.P.D. arrived, Sam Cooke was found wearing just his sport’s jacket and a shoe. It was a surreal sight. Since then, Sam Cooke’s somewhat unsavoury death has been shrouded in controversy. Nobody knows for certain what happened. Was Sam in the wrong or wronged? Even today, nobody knows. Rumours and conjecture surround what happened at the Hacienda Motel, Los Angeles. Sadly, we’ll never know for sure the truth surrounding Sam Cooke’s death. His death impacted on The Valentinos’ career. The death of Sam Cooke affected The Valentinos badly. He was their mentor, and the man who had guided their career for the past three years. For a few months, The Valentinos mourned their mentor. However, it wasn’t just The Valentinos that were affected by the death of Sam Cooke. Following the death of Sam Cooke, SAR Records folded. Sam Cooke was its driving force. Without him, SAR Records collapsed. This left The Valentinos without a record label. Nor for long. Having mourned the loss of Sam Cooke, The Valentinos signed to Chess Records in 1965, and in 1966, released two singles, Do It Right and Let’s Get Together. Neither single charted, and The Valentinos were dropped by Chess. However, by then, The Valentinos had been engulfed in scandal and become a quartet. In March 1965, Bobby Womack turned twenty-one. He also announced he was about to be married. His bride-to-be was none other than Barbara Campbell, Sam Cooke’s twenty-nine year old widow. This didn’t go down well with the public and Sam Cooke’s fans. The Valentinos were engulfed in scandal. When Bobby married Barbara, such was his admiration for Sam Cooke, that he even wore one of Sam’s suits. Later, Bobby said Barbara had asked him to do so. He also later claimed that at first, he only wanted to console Barbara, as he was scared she “may do something crazy.” However, within a few months, they were married. This came at a great cost to Bobby and The Valentinos. Following his marriage to Barbara, Bobby left The Valentinos, and embarked upon a solo career. However, DJs boycotted Bobby’s singles and many record buyers turned their back on Bobby Womack. Briefly, he was a musical pariah. So much so, that the only work he could get, was as a session musician. However, the loss of Bobby also affected The Valentinos. 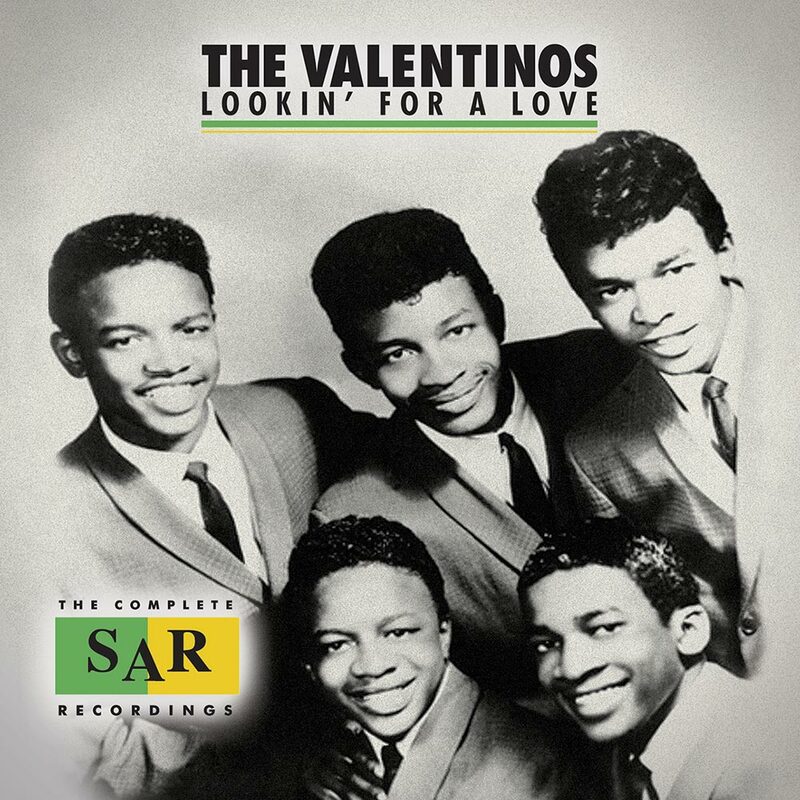 Listening back to Lookin’ For A Love-The Complete SAR Recordings, the loss of Bobby Womack affected The Valentinos badly. Bobby Womack played a huge part in The Valentinos sound. His unmistakable voice and harmonies from the rest of The Valentinos were like musical yin and yang. When Bobby combined power and passion, it was a joy to behold. So when Bobby left The Valentinos, it left a gaping hole, one that they would struggle to fill. After Bobby left what many people believe was the classic lineup of The Valentinos, they had to audition for several labels before signing to Chess Records. Following two unsuccessful singles, The Valentinos were dropped by Chess Records. This lead to Cecil Womack leaving The Valentinos. Not long after this, The Valentinos disbanded. With Bobby’s solo career struggling, and The Valentinos on hold, later in 1966, Bobby approached his brothers about getting the family band together. However, not long after this, Bobby’s star was in the ascendancy again and the idea was scrapped. He would work with his brothers again, but this time, they would add backing vocals on his solo albums. Never again, would the classic lineup of The Valentinos reunite. That was a missed opportunity. The Valentinos could’ve and should’ve been one of soul’s biggest bands. The Valentinos released the best music of their career between 1961 and 1964, when they were a quintet. Songs like Lookin’ For A Love, I’ll Make It All Right, It’s All Over Now and Everybody Wants To Fall In Love is a reminder of just what The Valentinos were capable. Sadly, fate intervened and the rise of rise of The Valentinos came to a halt with Sam Cooke’s death. After that, the collapse of SAR Records and loss of Bobby and then Cecil Womack, sabotaged the rise of The Valentinos. Never again, would The Valentinos reach the heights they enjoyed at SAR Records. That three year period, which is documented on Lookin’ For A Love-The Complete SAR Recordings, finds The Valentinos at their very best, when their star was on the ascendancy. ← RHYTHM ’N’ BLUESIN’ BY THE BAYOU-MAD DOGS, SWEET DADDIES AND PRETTY BABIES.